Apple is airing a new ad spot in primetime today. Focused on privacy, the spot is visually cued, with no dialog and a simple tagline: Privacy. That’s iPhone. The spot will air tonight in primetime in the U.S. and extend through March Madness. It will then air in select other countries. You’d have to be hiding under a rock not to have noticed Apple positioning privacy as a differentiating factor between itself and other companies. Beginning a few years ago, CEO Tim Cook began taking more and more public stances on what the company felt to be your “rights” to privacy on their platform and how that differed from other companies. The undercurrent being that Apple was able to take this stance because its first-party business relies on a relatively direct relationship with customers who purchase its hardware and, increasingly, its services. This stands in contrast to the model of other tech giants like Google or Facebook that insert an interstitial layer of monetization strategy on top of that relationship in the forms of application of personal information about you (in somewhat anonymized fashion) to sell their platform to advertisers that in turn can sell to you better. Turning the ethical high ground into a marketing strategy is not without its pitfalls, though, as Apple has discovered recently with a (now patched) high-profile FaceTime bug that allowed people to turn your phone into a listening device, Facebook’s manipulation of App Store permissions and the revelation that there was some long overdue house cleaning needed in its Enterprise Certificate program. I did find it interesting that the iconography of the “Private Side” spot very, very closely associates the concepts of privacy and security. They are separate, but interrelated, obviously. This spot says these are one and the same. It’s hard to enforce privacy without security, of course, but in the mind of the public I think there is very little difference between the two. Still, there is room to run, I feel, when it comes to Apple adjudicating what should be considered a societal norm when it comes to the use of personal data on its platform. If it’s going to be the absolute arbiter of what flies on the world’s most profitable application marketplace, it might as well use that power to get a little more feisty with the bigcos (and littlecos) that make their living on our data. I mention the issues Apple has had above not as a dig, though some might be inclined to view Apple integrating privacy with marketing as boldness bordering on hubris. I, personally, think there’s still a major difference between a company that has situational loss of privacy while having a systemic dedication to privacy and, well, most of the rest of the ecosystem which exists because they operate an “invasion of privacy as a service” business. Many major companies, like Air Canada, Hollister and Expedia, are recording every tap and swipe you make on their iPhone apps. In most cases you won’t even realize it. And they don’t need to ask for permission. You can assume that most apps are collecting data on you. Some even monetize your data without your knowledge. But TechCrunch has found several popular iPhone apps, from hoteliers, travel sites, airlines, cell phone carriers, banks and financiers, that don’t ask or make it clear — if at all — that they know exactly how you’re using their apps. Worse, even though these apps are meant to mask certain fields, some inadvertently expose sensitive data. Apps like Abercrombie & Fitch, Hotels.com and Singapore Airlines also use Glassbox, a customer experience analytics firm, one of a handful of companies that allows developers to embed “session replay” technology into their apps. These session replays let app developers record the screen and play them back to see how its users interacted with the app to figure out if something didn’t work or if there was an error. Every tap, button push and keyboard entry is recorded — effectively screenshotted — and sent back to the app developers. 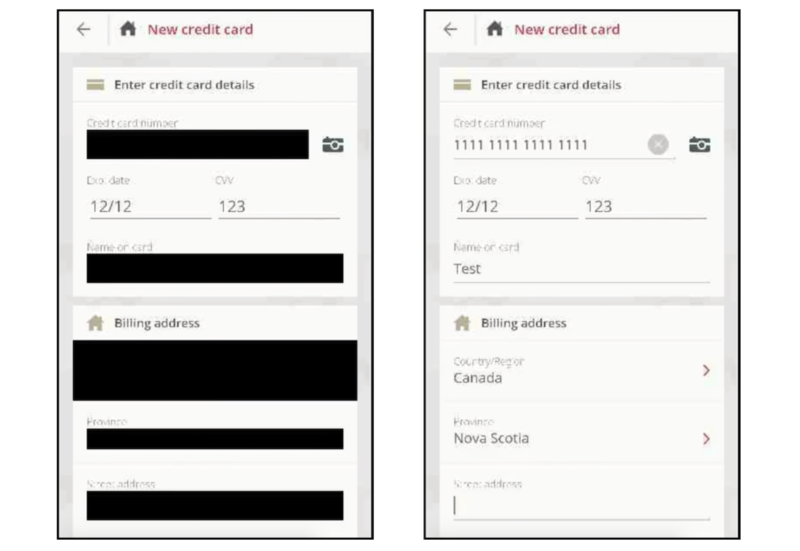 The App Analyst, a mobile expert who writes about his analyses of popular apps on his eponymous blog, recently found Air Canada’s iPhone app wasn’t properly masking the session replays when they were sent, exposing passport numbers and credit card data in each replay session. Just weeks earlier, Air Canada said its app had a data breach, exposing 20,000 profiles. “This gives Air Canada employees — and anyone else capable of accessing the screenshot database — to see unencrypted credit card and password information,” he told TechCrunch. We asked The App Analyst to look at a sample of apps that Glassbox had listed on its website as customers. Using Charles Proxy, a man-in-the-middle tool used to intercept the data sent from the app, the researcher could examine what data was going out of the device. Not every app was leaking masked data; none of the apps we examined said they were recording a user’s screen — let alone sending them back to each company or directly to Glassbox’s cloud. That could be a problem if any one of Glassbox’s customers aren’t properly masking data, he said in an email. “Since this data is often sent back to Glassbox servers I wouldn’t be shocked if they have already had instances of them capturing sensitive banking information and passwords,” he said. The App Analyst said that while Hollister and Abercrombie & Fitch sent their session replays to Glassbox, others like Expedia and Hotels.com opted to capture and send session replay data back to a server on their own domain. He said that the data was “mostly obfuscated,” but did see in some cases email addresses and postal codes. The researcher said Singapore Airlines also collected session replay data but sent it back to Glassbox’s cloud. Without analyzing the data for each app, it’s impossible to know if an app is recording a user’s screens of how you’re using the app. We didn’t even find it in the small print of their privacy policies. We asked all of the companies to point us to exactly where in its privacy policies it permits each app to capture what a user does on their phone. “I think users should take an active role in how they share their data, and the first step to this is having companies be forthright in sharing how they collect their users data and who they share it with,” said The App Analyst. “Glassbox has a unique capability to reconstruct the mobile application view in a visual format, which is another view of analytics, Glassbox SDK can interact with our customers native app only and technically cannot break the boundary of the app,” the spokesperson said, such as when the system keyboard covers part of the native app, “Glassbox does not have access to it,” the spokesperson said. Glassbox is one of many session replay services on the market. Appsee actively markets its “user recording” technology that lets developers “see your app through your user’s eyes,” while UXCam says it lets developers “watch recordings of your users’ sessions, including all their gestures and triggered events.” Most went under the radar until Mixpanel sparked anger for mistakenly harvesting passwords after masking safeguards failed. It’s not an industry that’s likely to go away any time soon — companies rely on this kind of session replay data to understand why things break, which can be costly in high-revenue situations. But for the fact that the app developers don’t publicize it just goes to show how creepy even they know it is. Got a tip? You can send tips securely over Signal and WhatsApp to +1 646-755–8849. You can also send PGP email with the fingerprint: 4D0E 92F2 E36A EC51 DAAE 5D97 CB8C 15FA EB6C EEA5. What does consent as a valid legal basis for processing personal data look like under Europe’s updated privacy rules? It may sound like an abstract concern but for online services that rely on things being done with user data in order to monetize free-to-access content this is a key question now the region’s General Data Protection Regulation is firmly fixed in place. The GDPR is actually clear about consent. But if you haven’t bothered to read the text of the regulation, and instead just go and look at some of the self-styled consent management platforms (CMPs) floating around the web since May 25, you’d probably have trouble guessing it. Confusing and/or incomplete consent flows aren’t yet extinct, sadly. But it’s fair to say those that don’t offer full opt-in choice are on borrowed time. Because if your service or app relies on obtaining consent to process EU users’ personal data — as many free at the point-of-use, ad-supported apps do — then the GDPR states consent must be freely given, specific, informed and unambiguous. That means you can’t bundle multiple uses for personal data under a single opt-in. Nor can you obfuscate consent behind opaque wording that doesn’t actually specify the thing you’re going to do with the data. You also have to offer users the choice not to consent. So you cannot pre-tick all the consent boxes that you really wish your users would freely choose — because you have to actually let them do that. It’s not rocket science but the pushback from certain quarters of the adtech industry has been as awfully predictable as it’s horribly frustrating. This has not gone unnoticed by consumers either. Europe’s Internet users have been filing consent-based complaints thick and fast this year. And a lot of what is being claimed as ‘GDPR compliant’ right now likely is not. So, some six months in, we’re essentially in a holding pattern waiting for the regulatory hammers to come down. But if you look closely there are some early enforcement actions that show some consent fog is starting to shift. But late last month French data protection watchdog, the CNIL, announced the closure of a formal warning it issued this summer against drive-to-store adtech firm, Fidzup — saying it was satisfied it was now GDPR compliant. Such a regulatory stamp of approval is obviously rare this early in the new legal regime. So while Fidzup is no adtech giant its experience still makes an interesting case study — showing how the consent line was being crossed; how, working with CNIL, it was able to fix that; and what being on the right side of the law means for a (relatively) small-scale adtech business that relies on consent to enable a location-based mobile marketing business. From zero to GDPR hero? Those two elements — detectors in physical stores; and a personal data-gathering SDK in mobile apps — come together to power Fidzup’s retail-focused, location-based ad service which pushes ads to mobile users when they’re near a partner store. The system also enables it to track ad-to-store conversions for its retail partners. The problem Fidzup had, back in July, was that after an audit of its business the CNIL deemed it did not have proper consent to process users’ geolocation data to target them with ads. Fidzup says it had thought its business was GDPR compliant because it took the view that app publishers were the data processors gathering consent on its behalf; the CNIL warning was a wake up call that this interpretation was incorrect — and that it was responsible for the data processing and so also for collecting consents. The regulator found that when a smartphone user installed an app containing Fidzup’s SDK they were not informed that their location and mobile device ID data would be used for ad targeting, nor the partners Fidzup was sharing their data with. CNIL also said users should have been clearly informed before data was collected — so they could choose to consent — instead of information being given via general app conditions (or in store posters), as was the case, after the fact of the processing. It also found users had no choice to download the apps without also getting Fidzup’s SDK, with use of such an app automatically resulting in data transmission to partners. Fidzup’s approach to consent had also only been asking users to consent to the processing of their geolocation data for the specific app they had downloaded — not for the targeted ad purposes with retail partners which is the substance of the firm’s business. So there was a string of issues. And when Fidzup was hit with the warning the stakes were high, even with no monetary penalty attached. Because unless it could fix the core consent problem, the 2014-founded startup might have faced going out of business. Or having to change its line of business entirely. Instead it decided to try and fix the consent problem by building a GDPR-compliant CMP — spending around five months liaising with the regulator, and finally getting a green light late last month. A core piece of the challenge, as co-founder and CEO Olivier Magnan-Saurin tells it, was how to handle multiple partners in this CMP because its business entails passing data along the chain of partners — each new use and partner requiring opt-in consent. “The first challenge was to design a window and a banner for multiple data buyers,” he tells TechCrunch. “So that’s what we did. The challenge was to have something okay for the CNIL and GDPR in terms of wording, UX etc. And, at the same time, some things that the publisher will allow to and will accept to implement in his source code to display to his users because he doesn’t want to scare them or to lose too much. As a quick related aside, it’s worth noting that Fidzup does not work with the thousands of partners an ad exchange or demand-side platform most likely would be. Magnan-Saurin tells us its CMP lists 460 partners. So while that’s still a lengthy list to have to put in front of consumers — it’s not, for example, the 32,000 partners of another French adtech firm, Vectaury, which has also recently been on the receiving end of an invalid consent ruling from the CNIL. In turn, that suggests the ‘Fidzup fix’, if we can call it that, only scales so far; adtech firms that are routinely passing millions of people’s data around thousands of partners look to have much more existential problems under GDPR — as we’ve reported previously re: the Vectaury decision. Returning to Fidzup, its fix essentially boils down to actually offering people a choice over each and every data processing purpose, unless it’s strictly necessary for delivering the core app service the consumer was intending to use. Which also means giving app users the ability to opt out of ads entirely — and not be penalized by not being able to use the app features itself. In short, you can’t bundle consent. So Fidzup’s CMP unbundles all the data purposes and partners to offer users the option to consent or not. “Of course, as a user, I can refuse everything. Say no, I don’t want my data to be collected, I don’t want to send my data. And I have to be able, as a user, to use the app in the same way as if I accept or refuse the data collection,” he adds. He says the CNIL was very clear on the latter point — telling it they could not require collection of geolocation data for ad targeting for usage of the app. This is especially interesting in light of the ‘forced consent’ complaints filed against tech giants Facebook and Google earlier this year. These complaints argue the companies should (but currently do not) offer an opt-out of targeted advertising, because behavioural ads are not strictly necessary for their core services (i.e. social networking, messaging, a smartphone platform etc). Facebook of course maintains its approach is 100% GDPR compliant. Even as data privacy experts aren’t so sure. In Fidzup’s case, complying with GDPR has had a major impact on its business because offering a genuine choice means it’s not always able to obtain consent. Magnan-Saurin says there is essentially now a limit on the number of device users advertisers can reach because not everyone opts in for ads. Although, since it’s been using the new CMP, he says a majority are still opting in (or, at least, this is the case so far) — showing one consent chart report with a ~70:30 opt-in rate, for example. Now he says the point for adtech businesses with EU users is figuring out how to extrapolate from the percentage of user data they can (legally) collect to the 100% they can’t. And that’s what Fidzup has been working on this year, developing machine learning algorithms to try to bridge the data gap so it can still offer its retail partners accurate predictions for tracking ad to store conversions. “Now the challenge is to be as accurate as we can be without having 100% of real data — with the consent, and the real picture,” he adds. “The accuracy is less… but not that much. We have a very, very high standard of quality on that… So now we can assure the retailers that with our machine learning system they have nearly the same quality as they had before. Having a CMP that’s had regulatory ‘sign-off’, as it were, is something Fidzup is also now hoping to turn into a new bit of additional business. It’s not currently charging publishers to use the CMP but will be seeing whether it can turn it into a paid product early next year. How then, after months of compliance work, does Fidzup feel about GDPR? Does it believe the regulation is making life harder for startups vs tech giants — as is sometimes suggested, with claims put forward by certain lobby groups that the law risks entrenching the dominance of better resourced tech giants. Or does he see any opportunities? In Magnan-Saurin’s view, six months in to GDPR European startups are at an R&D disadvantage vs tech giants because U.S. companies like Facebook and Google are not (yet) subject to a similarly comprehensive privacy regulation at home — so it’s easier for them to bag up user data for whatever purpose they like. “The fact is Facebook-Google they own like 90% of the revenue in mobile advertising in the world. And they are American. So basically they can do all their research and development on, for example, American users without any GDPR regulation,” he says. “And then apply a pattern of GDPR compliance and apply the new product, the new algorithm, everywhere in the world. He suggests some European startups might relocate R&D efforts outside the region to try to workaround the legal complexity around privacy. But the fact of GDPR enforcement having — perhaps inevitably — started small, with so far a small bundle of warnings against relative data minnows, rather than any swift action against the industry dominating adtech giants, that’s being felt as yet another inequality at the startup coalface. A UK parliamentary committee has published the cache of Facebook documents it dramatically seized last week. The documents were obtained by a legal discovery process by a startup that’s suing the social network in a California court in a case related to Facebook changing data access permissions back in 2014/15. The court had sealed the documents but the DCMS committee used rarely deployed parliamentary powers to obtain them from the Six4Three founder, during a business trip to London. You can read the redacted documents here — all 250 pages of them. In a series of tweets regarding the publication, committee chair Damian Collins says he believes there is “considerable public interest” in releasing them. “They raise important questions about how Facebook treats users data, their policies for working with app developers, and how they exercise their dominant position in the social media market,” he writes. The committee has been investigating online disinformation and election interference for the best part of this year, and has been repeatedly frustrated in its attempts to extract answers from Facebook. But it is protected by parliamentary privilege — hence it’s now published the Six4Three files, having waited a week in order to redact certain pieces of personal information. Collins has included a summary of key issues, as the committee sees them after reviewing the documents, in which he draws attention to six issues. White Lists Facebook have clearly entered into whitelisting agreements with certain companies, which meant that after the platform changes in 2014/15 they maintained full access to friends data. It is not clear that there was any user consent for this, nor how Facebook decided which companies should be whitelisted or not. Value of friends data It is clear that increasing revenues from major app developers was one of the key drivers behind the Platform 3.0 changes at Facebook. The idea of linking access to friends data to the financial value of the developers relationship with Facebook is a recurring feature of the documents. Reciprocity Data reciprocity between Facebook and app developers was a central feature in the discussions about the launch of Platform 3.0. Android Facebook knew that the changes to its policies on the Android mobile phone system, which enabled the Facebook app to collect a record of calls and texts sent by the user would be controversial. To mitigate any bad PR, Facebook planned to make it as hard of possible for users to know that this was one of the underlying features of the upgrade of their app. Onavo Facebook used Onavo to conduct global surveys of the usage of mobile apps by customers, and apparently without their knowledge. They used this data to assess not just how many people had downloaded apps, but how often they used them. This knowledge helped them to decide which companies to acquire, and which to treat as a threat. Targeting competitor Apps The files show evidence of Facebook taking aggressive positions against apps, with the consequence that denying them access to data led to the failure of that business. Facebook has posted a lengthy response (read it here) positing that the “set of documents, by design, tells only one side of the story and omits important context.” They give a blow-by-blow response to Collins’ points below though they are ultimately pretty selective in what they actually address. The publication of the files comes at an awkward moment for Facebook — which remains on the back foot after a string of data and security scandals, and has just announced a major policy change — ending a long-running ban on apps copying its own platform features. Albeit the timing of Facebook’s policy shift announcement hardly looks incidental — given Collins said last week the committee would publish the files this week. The policy in question has been used by Facebook to close down competitors in the past, such as — two years ago — when it cut off style transfer app Prisma’s access to its live-streaming Live API when the startup tried to launch a livestreaming art filter (Facebook subsequently launched its own style transfer filters for Live). So its policy reversal now looks intended to diffuse regulatory scrutiny around potential antitrust concerns. But emails in the Six4Three files suggesting that Facebook took “aggressive positions” against competing apps could spark fresh competition concerns. In one email dated January 24, 2013, a Facebook staffer, Justin Osofsky, discusses Twitter’s launch of its short video clip app, Vine, and says Facebook’s response will be to close off its API access. “As part of their NUX, you can find friends via FB. Unless anyone raises objections, we will shut down their friends API access today. We’ve prepared reactive PR, and I will let Jana know our decision,” he writes. Also of concern on the competition front is Facebook’s use of a VPN startup it acquired, Onavo, to gather intelligence on competing apps — either for acquisition purposes or to target as a threat to its business. The files show various Onavo industry charts detailing reach and usage of mobile apps and social networks — with each of these graphs stamped ‘highly confidential’. Facebook bought Onavo back in October 2013. Shortly after it shelled out $19BN to acquire rival messaging app WhatsApp — which one Onavo chart in the cache indicates was beasting Facebook on mobile, accounting for well over double the daily message sends at that time. The files also spotlight several issues of concern relating to privacy and data protection law, with internal documents raising fresh questions over how or even whether (in the case of Facebook’s whitelisting agreements with certain developers) it obtained consent from users to process their personal data. The company is already facing a number of privacy complaints under the EU’s GDPR framework over its use of ‘forced consent‘, given that it does not offer users an opt-out from targeted advertising. But the Six4Three files look set to pour fresh fuel on the consent fire. Collins’ fourth line item — related to an Android upgrade — also speaks loudly to consent complaints. Earlier this year Facebook was forced to deny that it collects calls and SMS data from users of its Android apps without permission. But, as we wrote at the time, it had used privacy-hostile design tricks to sneak expansive data-gobbling permissions past users. So, put simple, people clicked ‘agree’ without knowing exactly what they were agreeing to. The Six4Three files back up the notion that Facebook was intentionally trying to mislead users. Another awkward trust issue for Facebook which the documents could stir up afresh relates to its repeat claim — including under questions from lawmakers — that it does not sell user data. In one email from the cache — sent by Mark Zuckerberg, dated October 7, 2012 — the Facebook founder appears to be entertaining the idea of charging developers for “reading anything, including friends”. He did not include a caveat that he had apparently personally entertained the idea of liberally selling access to user data. As we’ve said many times, the documents Six4Three gathered for their baseless case are only part of the story and are presented in a way that is very misleading without additional context. We stand by the platform changes we made in 2015 to stop a person from sharing their friends’ data with developers. Like any business, we had many of internal conversations about the various ways we could build a sustainable business model for our platform. But the facts are clear: we’ve never sold people’s data. Zuckerberg has repeatedly refused to testify in person to the DCMS committee. At its last public hearing — which was held in the form of a grand committee comprising representatives from nine international parliaments, all with burning questions for Facebook — the company sent its policy VP, Richard Allan, leaving an empty chair where Zuckerberg’s bum should be. After two years coming down the pipe at tech giants, Europe’s new privacy framework, the General Data Protection Regulation (GDPR), is now being applied — and long time Facebook privacy critic, Max Schrems, has wasted no time in filing four complaints relating to (certain) companies’ ‘take it or leave it’ stance when it comes to consent. The complaints have been filed on behalf of (unnamed) individual users — with one filed against Facebook; one against Facebook-owned Instagram; one against Facebook-owned WhatsApp; and one against Google’s Android. “It’s simple: Anything strictly necessary for a service does not need consent boxes anymore. For everything else users must have a real choice to say ‘yes’ or ‘no’,” Schrems writes in a statement. Schrems most recently founded a not-for-profit digital rights organization to focus on strategic litigation around the bloc’s updated privacy framework, and the complaints have been filed via this crowdfunded NGO — which is called noyb (aka ‘none of your business’). As we pointed out in our GDPR explainer, the provision in the regulation allowing for collective enforcement of individuals’ data rights is an important one, with the potential to strengthen the implementation of the law by enabling non-profit organizations such as noyb to file complaints on behalf of individuals — thereby helping to redress the power imbalance between corporate giants and consumer rights. That said, the GDPR’s collective redress provision is a component that Member States can choose to derogate from, which helps explain why the first four complaints have been filed with data protection agencies in Austria, Belgium, France and Hamburg in Germany — regions that also have data protection agencies with a strong record of defending privacy rights. Given that the Facebook companies involved in these complaints have their European headquarters in Ireland it’s likely the Irish data protection agency will get involved too. And it’s fair to say that, within Europe, Ireland does not have a strong reputation as a data protection rights champion. But the GDPR allows for DPAs in different jurisdictions to work together in instances where they have joint concerns and where a service crosses borders — so noyb’s action looks intended to test this element of the new framework too. Under the penalty structure of GDPR, major violations of the law can attract fines as large as 4% of a company’s global revenue which, in the case of Facebook or Google, implies they could be on the hook for more than a billion euros apiece — if they are deemed to have violated the law, as the complaints argue. That said, given how freshly fixed in place the rules are, some EU regulators may well tread softly on the enforcement front — at least in the first instances, to give companies some benefit of the doubt and/or a chance to make amends to come into compliance if they are deemed to be falling short of the new standards. However, in instances where companies themselves appear to be attempting to deform the law with a willfully self-serving interpretation of the rules, regulators may feel they need to act swiftly to nip any disingenuousness in the bud. “We probably will not immediately have billions of penalty payments, but the corporations have intentionally violated the GDPR, so we expect a corresponding penalty under GDPR,” writes Schrems. Only yesterday, for example, Facebook founder Mark Zuckerberg — speaking in an on stage interview at the VivaTech conference in Paris — claimed his company hasn’t had to make any radical changes to comply with GDPR, and further claimed that a “vast majority” of Facebook users are willingly opting in to targeted advertising via its new consent flow. “We’ve been rolling out the GDPR flows for a number of weeks now in order to make sure that we were doing this in a good way and that we could take into account everyone’s feedback before the May 25 deadline. And one of the things that I’ve found interesting is that the vast majority of people choose to opt in to make it so that we can use the data from other apps and websites that they’re using to make ads better. Because the reality is if you’re willing to see ads in a service you want them to be relevant and good ads,” said Zuckerberg. Asked about how Facebook’s business model will be affected by the new rules, Zuckerberg essentially claimed nothing significant will change — “because giving people control of how their data is used has been a core principle of Facebook since the beginning”. “The GDPR adds some new controls and then there’s some areas that we need to comply with but overall it isn’t such a massive departure from how we’ve approached this in the past,” he claimed. “I mean I don’t want to downplay it — there are strong new rules that we’ve needed to put a bunch of work into making sure that we complied with — but as a whole the philosophy behind this is not completely different from how we’ve approached things. Zuckerberg faced a range of tough questions on these points from the EU parliament earlier this week. But he avoided answering them in any meaningful detail. So EU regulators are essentially facing a first test of their mettle — i.e. whether they are willing to step up and defend the line of the law against big tech’s attempts to reshape it in their business model’s image. Privacy laws are nothing new in Europe but robust enforcement of them would certainly be a breath of fresh air. And now at least, thanks to GDPR, there’s a penalties structure in place to provide incentives as well as teeth, and spin up a market around strategic litigation — with Schrems and noyb in the vanguard. Schrems also makes the point that small startups and local companies are less likely to be able to use the kind of strong-arm ‘take it or leave it’ tactics on users that big tech is able to unilaterally apply and extract ‘consent’ as a consequence of the reach and power of their platforms — arguing there’s an underlying competition concern that GDPR could also help to redress.